People who play games generally care a great deal about the technical foundations of those games. Frame rates, benchmarks, loading times, resolution, ping rates, and so on. And, when these things don’t go perfectly, people who play games tend to get very cranky about it. But I don’t care, in most cases. I genuinely don’t understand why other people care so much about frame rates across a host of different games – or any other technical issue they come across, for that matter. The technical foundations of a game are just that; the foundations. Fixating on those is missing the point of an awful lot of games. And it is only the games industry where this happens with such incredible frequency. There are other highly technical artistic mediums out there. Film being the perfect example. And within any film project of a reasonable size, there are going to be people on the team who are exclusively focused on the technical elements of the film. But the real creatives – the writers, directors and actors – are not. They’re structured, but ultimately those structures that they work within underpin the performance. They’re not the performance in themselves. And when people talk about films, they generally focus on what story the film is telling, and the quality of the performances; the narrative. Sergei Eisenstein’s writings, as one of the earliest and most important film theorists, were very much focused on establishing a groundwork on how films should be structured, but he did so in the context of the narrative and artistic effect that that his technical innovation would enable. Tonally, it’s very different to the games industry, where there’s an unending pursuit of technical advancement with, often, very little attention paid to why those enhancements should be made in the first place. It’s accepted as self-evidently good that games are now in 4K and HDR, but I’ve yet to encounter a game that had to be in HDR because HDR was critical to the storytelling. It’s superficial, and yet it’s what this industry fixates on – both at the developer and consumer level. And when it comes to frame rates there are people that won’t touch a game that’s not consistently 60 frames per second, regardless of whether it needed to be in the first place. It’s childish, but it’s also incredibly common. There are of course examples where, if a game isn’t near-perfect with frame rate and netcode, the game’s fundamental experience is ruined. Any competitive multiplayer game needs to have a smooth, consistent framerate, else the game’s simply going to fail in facilitating competition, and a failed game is, well, a failed game. A couple of times I’ve run into people in Dissidia Final Fantasy who have clearly got bad connections. The jankiness that you had to deal with made the game near unplayable (thankfully that’s happened one per cent of times, if that, and for the most part that game’s netcode is rock solid). Overwatch wouldn’t work if its framerate ever dipped. In League of Legends timing is so critical that a half second’s jag can cost you the game. I understand that for those games, obviously it’s critical the developer makes no mistakes with frame rates and the like in those games. Outside of the competitive space there are genres that I actually enjoy playing where frame rates are important, too. I once played a rhythm game where there was some slowdown. I can’t remember which one it is now. I didn’t play it long. Fighting games aren’t much fun against the AI or your better half in local multiplayer if there’s a frame rate stutter there, too. But that’s not every game. Not even close. What’s important for a single player, narrative-driven game (which is what I play more than anything else) is the story, amazingly enough. Yes, I play games for the narrative. There are a lot of great narratives out there. Frame rate means nothing to the standard of Final Fantasy VI or Persona 4, and it means very little to more modern JRPGs than a lot of people are willing to admit. As long as the underlying foundations of the game allow a person to finish it (i.e. I can get to the end and defeat the final boss and watch the credits), I don’t care about those foundations. Neither should other people. A cut scene that runs at 30 frames per second is no different to one that runs at 60 frames per second. A visual novel isn’t affected if there’s a framerate stutter at some point. A turn based RPG that has a bit of jank here and there isn’t anywhere near 'unplayable.' It's a minor irritation at best. And sure, games look that have more refined art design look better on the eyes. But it didn’t matter how good Horizon looked, the narrative was so simple and juvenile that not once have I ever felt the urge to go back and play that one again. So why the endless discussions about frame rates, resolution, and other technical elements? Why was that listed as a major feature and talking point of Shadow of the Colossus, when the majesty of the game is in regards to its narrative? 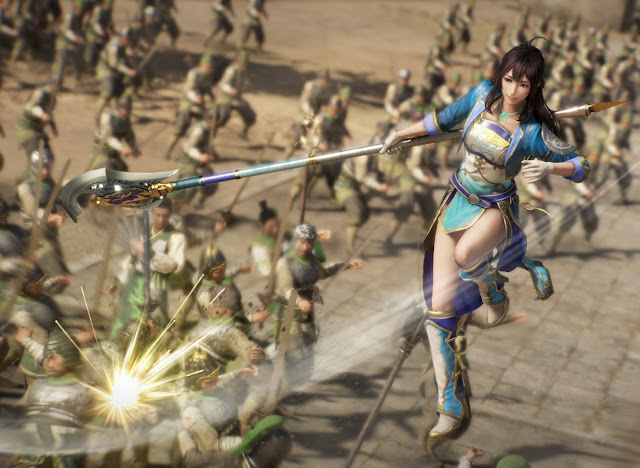 Why the endless whining about Dynasty Warriors 9’s frame rate, rather than a considered discussion about how the game depicts some incredible moments of history? Is it because it’s easier to notice, and then discuss stuff you can put a number to? It’s far easier to say something like “the frame rate dips below 30fps, this is a terrible game,” than it is to have a debate about whether Cao Cao’s depiction in Dynasty Warriors is overly generous to his tyrannical impulses in the real history. But then it's the latter that is far more important to the game that Dynasty Warriors 9 was made to be. It’s the discussion that we should be having. In fixating on the petty, people overlook the purpose, intent, and real value of far too many games. It’s like complaining that War And Peace takes too long to read, or that the frame that the Mona Lisa is held within isn’t good enough. The superficiality with which we discuss so many games in this industry is a genuine problem, because it actively discourages game developers from focusing on anything but the technical elements. As long as a game is functional, I focus on what the developer actually tried to achieve with their game, rather than the canvas they used to do so. I’d recommend others did that too. We’ll end up with better stories and storytelling in our games then.